Railroad tracks are still flooded in some parts of the nation’s breadbasket – from eastern Nebraska to western Iowa, as well as in portions of Missouri – after a historic storm plowed through the region in mid-March. But through sheer grit and determination, repair teams have been chipping away at the damage, drastically reducing disruptions to transportation. 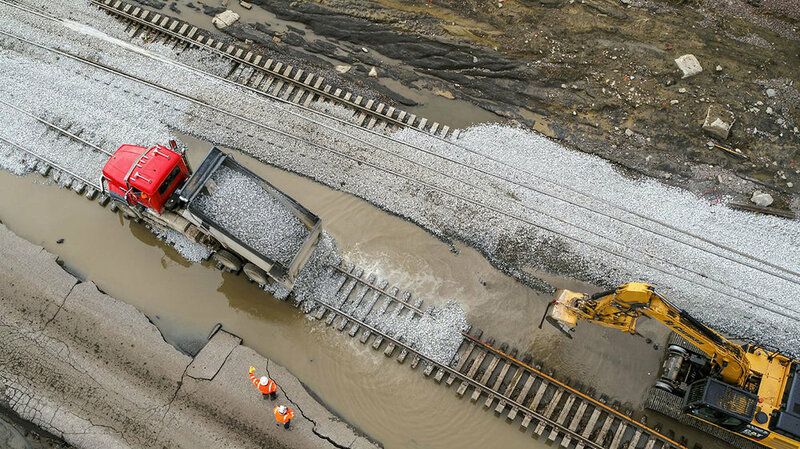 Trains in the region screeched to a halt after hundreds of miles of tracks became waterlogged and subsequently damaged, but they’re getting back on track rather quickly. BNSF (NYSE: BRK), the largest railroad network in the U.S., has worked to get several of its subdivisions back on line since March 29, with only a few remaining out of service. The company still has some embargoes in place in response to the remaining outages. Only traffic for BNSF company materials is permitted into the embargoed locations. BNSF’s rail network consists of 32,500 route-miles running through 28 states, as well as three Canadian provinces. In 2017, BNSF hauled 1.1 million carloads of agricultural commodities, and moved enough grain to supply 900 million people with a year’s supply of bread. Many farms in Nebraska and Iowa were destroyed by the floods, and these states are two of the nation’s largest producers of grains and corn. It’s important to get these trains moving again in order to get crops and cattle that survived back into transit. Union Pacific operates 8,500 locomotives on more than 32,100 route-miles in 23 states west of Chicago and New Orleans. It’s the second-largest railroad network in the U.S., right behind BNSF, and is one of the world's largest transportation companies. The Union Pacific Railroad is the principal operating company of Union Pacific Corporation, both headquartered in Omaha, Nebraska. Both railroad companies are closely watching some subdivisions that were recently opened because of persistent flooding upstream, and the threat for more flooding in the near future. Another major storm will likely produce blizzard conditions in the Dakotas and the western half of Nebraska on Wednesday and Thursday (April 10 and 11). At the same time, on the warm side of the storm, heavy rain may return to the flood-damaged areas in eastern Nebraska, including Omaha, as well as dousing western Iowa. You can find the latest official winter weather alerts from the National Weather Service here, and look for weather updates on the FreightWaves website.